The Lebanese flag is formed of two horizontal red stripes enveloping a horizontal white stripe. The white stripe is to be two times a red one (ratio 1:2:1)—a Spanish fess. The green cedar in the middle touches both red stripes and its width is one third of the width of the flag. 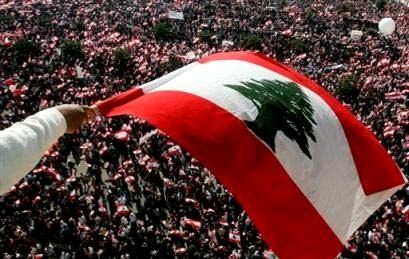 (The description of the flag is cited in the Lebanese Constitution, Chapter 1, Article 5.) It is a common mistake to draw the branches of the cedar in brown or black. Nevertheless the mistake is unconstitutional. The cedar must be full green. The red stripes symbolize the pure blood shed in the aim of liberation. The white stripe symbolizes peace, and the white snow covering Lebanon's mountains. The green cedar (Arz) (Species: Cedrus libani or Lebanon Cedar) symbolizes immortality and steadiness. This cedar is referenced many times in the Bible: "The righteous flourish like the palm tree, and grow like a cedar in Lebanon" (Psalms 92:12). Through history, Lebanon, or at least its region, had taken the flag of the people who occupied it (Phoenician, Mamluk, Ottoman) . In the 18th century the Maronites used a white flag with a cedar tree in the centre. It seems that in the First World War, Lebanese nationalists added the red stripes, representing firstly, the martyrs' blood, and secondly, red and white were the colours of the Lebanese Legion, which, formed by the French in 1916, was the forerunner of the Lebanese Army. The Lebanese flag, during the French mandate (1918-1943), was designed by the president of the Lebanese Renaissance Movement, the late Naoum Mukarzel. It was similar to the tricolour flag of France but with a Cedar in the middle. Seeking for independence, the actual flag was first drawn in deputy Saeb Salam's house in Mousaitbeh by the deputies of the Lebanese parliament. It was adopted on December 7, 1943, during a meeting in the parliament, where the article 5 in the Lebanese constitution was modified.